Today I wanted to be able to watch the PyCon Live Stream while using OS X at work. A quick Google search returned an awesome program: Afloat. It lets me change the window settings for just about any OS X application. Right now I've got the live feed just lingering there in the background, pinned to my desktop. Loving it! I often find myself taking notes about various aspects of my job that I feel I would forget as soon as I moved onto another project. I've gotten into the habit of taking my notes using reStructured Text, which shouldn't come as any surprise to any of my regular visitors. On several occasions, I had some of the other guys in the company ask me for some clarification on some things I had taken notes on. Lucky for me, I had taken some nice notes! However, these individuals probably wouldn't appreciate reading ReST markup as much as I do, so I decided to do something nice for them. I setup Sphinx to prettify my documentation. I then wrote a small Web server using Python, so people within the company network could access the latest version of my notes without much hassle. Just like I take notes to remind myself of stuff at work, I want to do that again for this automated ReST->HTML magic--I want to be able to do this in the future! I figured I would make my notes even more public this time, so you all can enjoy similar bliss. I am writing this article with UNIX-like operating systems in mind. Please forgive me if you're a Windows user and some of this is not consistent with what you're seeing. Perhaps one day I'll try to set this sort of thing up on Windows. The first step that we want to take is installing Sphinx. This is the project that Python itself uses to generate its online documentation. It's pretty dang awesome. Feel free to skip this section if you have already installed Sphinx. It should be a pretty speedy installation. We'll be using Mercurial to keep track of changes to our ReST documentation. Mercurial is a distributed version control system that is built using Python. It's wonderful! Just like with Sphinx, if you have already installed Mercurial, feel free to skip to the next section. This will go out and download and install the latest stable Mercurial. You may need python-dev or something like that for your platform in order for that command to work. However, if you're on Windows, I highly recommend TortoiseHg. The installer for TortoiseHg will install a graphical Mercurial client along with the command line tools. Welcome to the Sphinx quickstart utility. Inside the root directory, two more directories will be created; "_templates"
files. You can enter another prefix (such as ".") to replace the underscore. The file name suffix for source files. Commonly, this is either ".txt"
or ".rst". Only files with this suffix are considered documents. of the documents. Normally, this is "index", but if your "index"
document is a custom template, you can also set this to another filename. Finished: An initial directory structure has been created. where "builder" is one of the supported builders, e.g. html, latex or linkcheck. We'll do our work in the source directory. Yes, this is my first document. It's lame. Deal with it. Don't worry that we don't see all of the directories in the output of hg st--Mercurial tracks files, not directories. Here comes the magic in automating the conversion from ReST to HTML: Mercurial hooks. We will use the precommit hook to fire off a command that tells Sphinx to translate our ReST markup into HTML. $ hg ci -m "Initial commit"
If you see something like that, you're in good shape. Go ahead and take a look at your new mydox/docs/index.html file in the Web browser of your choosing. Not very exciting, is it? Notice how your first_doc.rst doesn't appear anywhere on that page? That's because we didn't tell Sphinx to put it there. Let's do that now. That should do it. Now, I don't know about you, but I don't really want to include the output HTML, images, CSS, JS, or anything in my documentation repository. It would just take up more space each time we change an .rst file. Let's tell Mercurial to not pay attention to the output HTML--it'll just be static and always up-to-date on our filesystem. $ hg ci -m "Updating the index to include our .rst files"
Tada!! The first_doc.rst should now appear on the index page. Who seriously wants to have HTML files that are hard to get to? How can we make it easier to access those HTML files? Perhaps we can create a simple static file Web server? That might sound difficult, but it's really not--not when you have access to Python! This makes it possible for you to visit http://localhost/ on your own computer, or to use your computer's IP in place of localhost to access your documentation from a different computer on your network. Pretty slick, if you ask me. I suppose there's more I could add, but that's all I have time for tonight. Enjoy! One of the tools I find myself using more and more each day is the amazing grep. It helps me narrow down the list of potential problem children in my code. Sometimes it can even tell me exactly where I need to look if my parameters are specific enough. For example, the other day, I had a problem where some Python code was attempting to call isdigit() on an integer, when the variable was supposed to be a string. I could have scoured the code manually for all occurrences of the word "isdigit", or I could have used a "search in files" sort of feature in any useful text editor. There are likely other options too. However, I opted to use grep to find what I was looking for. Print NUM lines of trailing context after matching lines. Places a line containing -- between contiguous groups of matches. Print NUM lines of leading context before matching lines. Places a line containing -- between contiguous groups of matches. Print NUM lines of output context. Places a line containing -- between contiguous groups of matches. I thought this was so useful that I wrote a small shell script to wrap up my common options for grepping--recursive search, display line numbers, and (now) showing some context. Eventually I got around to cleaning up the output by dirtying up the script. Cleaning up the output involved only displaying a matching filename one time, with the line numbers for the context and matching lines below it. I also thought it would be easier to find matching lines if I could colorize the matched text. Here's my script as of noon today. I'm sure there are ways to make this more elegant, but I'm sure happy with it. This little dandy assisted me just this morning in helping a friend resolve some Django bugs! Every so often I find myself in need of a small ego boost (or reality check). One of the things I've done in the past to satisfy such a need is go to the PyPI and see how many downloads my packages have. Depending on how much time I have or how much effort I want to put into my pride, I may or may not check the download stats for all releases of each package. A couple of weeks ago, I was in the mood for an ego boost. It was actually an every day thing for nearly a week! So, instead of wasting a lot of time checking download stats for each version of each package I have on PyPI, I wrote a script to do it for me. It uses the XML-RPC API that PyPI offers. """Retrieves the release number for each uploaded release"""
"""Calculate the total number of downloads for the package"""
"""Prints a nicely formatted list of statistics about the package"""
I just learned yet another goodie about the Bash shell that I must share with you. This trick made my day on so many levels. 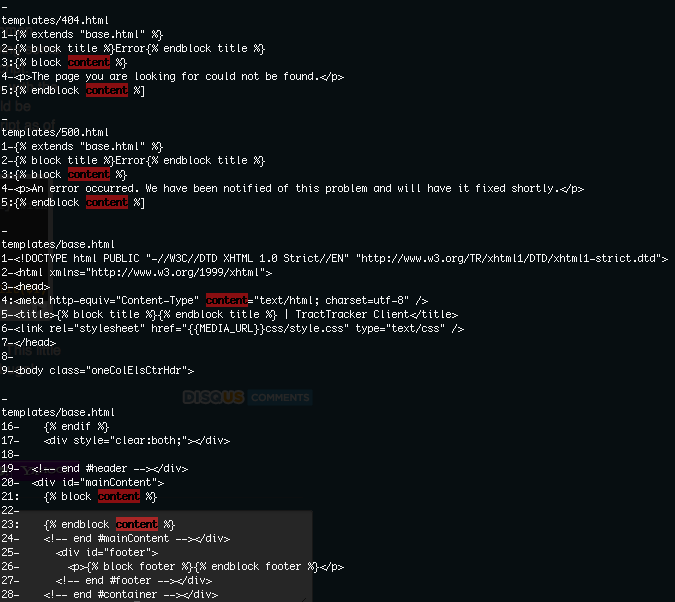 You know how annoying it is when you get those ridiculously long commands in a terminal window? You know how much more annoying it is when you generally can't Ctrl+arrow around the command to change bits and pieces when you're on OSX? If you've ever been in that boat, this tip is for you. Bash allows you to hit Ctrl+x Ctrl+e to edit your current command in your "preferred" editor. Your "preferred" editor is determined from the EDITOR environment variable. Since I'm a fan of VIM, all I need to do is make sure I've got export EDITOR=vim in my .bashrc or something along those lines. Once I do that, I can hit Ctrl+x Ctrl+e anytime I am using Bash and have a smelly, long command I want to manipulate. With all of the exciting updates to Mercurial recently, I've been on a rampage, updating various boxes everywhere I go. I'm in the habit of using easy_install and/or pip to install most of my Python-related packages. It's pretty easy to install packages that are in well-known locations (like PyPI or on Google Code, for example). It's also pretty easy to update packages using either utility. Both take a -U parameter, which, to my knowledge, tells it to actually check for updates and install the latest version. That's all fine and dandy, but what happens when you want to install an "unofficial" version of some package? I mean, what if your favorite project all of the sudden includes some feature that you will die unless you can have access to it and the next official version is weeks or months in the future? There are typically a few avenues you can take to satisfy your needs, but I wanted to bring up something that I think not many people are aware of: easy_install and pip can both understand URLs to installable Python packages. What do I mean by that, you ask? Well, when you get down to the basics of what both utilities do, they just take care of downloading some Python package and installing it with the setup.py file contained therein. In many cases, these utilities will search various package repositories, such as PyPI, to download whatever package you specify. If the package is found, it will be downloaded and extracted. Notice the version change from 1.2.1 to 1.4.1+4-8bce1e0d2801. w00t. Edit: devov pointed out that pip is capable of installing packages directly from its repository. I've never used this functionality, but I'm interested in trying it out sometime! Thanks devov! I just noticed that Mercurial 1.4.1 was released today. Most of the changes are pretty minor, but I wanted to voice my appreciation for a new extension that is included with this release: schemes. Not the most ground-breaking of extensions, but still pretty slick! Today I found myself trying to figure out how to make a terminal window stay permanent on my desktop or dashboard on OSX, similar to what I've done in the past with Linux. I just wanted to have the terminal window monitoring things in the background for me. Actually, all I wanted to do was keep track of when my local working copy of our Subversion repository was out of sync. I wanted a solution that would keep out of my way, but I also wanted it to be easy. My search for a solution seemed short-lived when a Google search suggested a dashboard widget for the Terminal application. The problem with it was that the download server was dead or simply blocked by my company's Internet filter. One way or another, it wasn't long before I went in search of another solution. ssh username@$MY_BOX "growlnotify -s -d47111 -n 'iTerm' -t 'Out Of Sync' -m 'Your working copy is out of sync. Repository is at revision $SVN_REV, and your working copy is at $MY_REV.'" Now, a little bit about my environment. As I've mentioned before, all of our development really takes place on Linux-powered virtual machines. We simply use our Macs as the system to interact with those virtual machines. That is why there's the ssh line in that script. -s: make the notification sticky--don't hide the notification until the user specifically closes it. -d47111: a unique identifier for the notification. This makes it so you can send the same message over and over and it would update any existing notifications with that ID instead of creating a new notification (unless one doesn't exist already). -n 'iTerm': I believe this was supposed to be the "source" application. I don't remember right now. -t 'Out Of Sync': The title for the notification. -m 'Your working copy...': The message to send to my Mac. This is a fabulous little reminder to me. I have it set up as a cronjob that runs every minute on my Linux-powered development virtual machine. Hopefully this will help others!